Alexander Balas was the ruler of the Greek Seleucid kingdom in 150–146 BC. 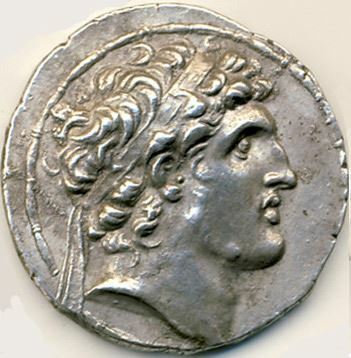 Alexander defeated Demetrius Soter for the crown in 150 BC. Alexander was a native of Smyrna of humble origin, but pretended to be the son of Antiochus IV Epiphanes and heir to the Seleucid throne. Alexander's claims were recognized by the Roman Senate, Ptolemy Philometor of Egypt and others. He married Cleopatra Thea, a daughter of the Ptolemaic dynasty. At first unsuccessful, Alexander finally defeated Demetrius Soter in 150 BC. Demetrius Soter's son Demetrius II profited by the opportunity to regain the throne. Alexander was defeated in 145 BC at the battle of Antioch in Syria. He fled for refuge to a Nabataean prince, who murdered him and sent his head to Ptolemy Philometor.